I don’t know about anyone else, but I have a sneaky feeling that I still feel pretty much the same as you all do. Bit like a wounded animal who desperately needs a vet, but can’t get to one. I hurt from that defeat, or rather embarrassment against Chelsea and I just can’t seem to shake it off. Maybe half the problem is that it followed the defeat against the Mancs on our own turf, being knocked out of the FA Cup by Stoke. Had the defeats been spread out through the season, maybe it wouldn’t feel quite so bad, but it does. Not only is it hard enough to stomach, but then you have to read all the comments from the likes of Ballack who says we are too soft, Deco, who says we are bottlers and then the only thing our leader can say is we were ‘Naive’ – how can he say that? Arsene, you are the one being naive, you are the one who thinks that all of our players are good enough – you are clearly very very wrong. Ok, we can’t do anything about it right now because the transfer window has closed but come the summer things have to change, and quite dramatically in my mere humble opinion. I won’t jump on the ‘Arsene Wenger out’ bandwagon just yet, but I have to say that I don’t think it will be too long before I do – probably right at the end of the summer!! Listening to some of the pundits yesterday, some of them are now questioning how he has been allowed to continue as our manager when things have gone the way they have for so long. I haven’t really heard them say that before, but of course, they are right. Then to hear Nigel Winterburn – he made it sound so very simple; he echoed the opinions of most of the fans. He said we need to bring in experience – a keeper, defender, midfielder and a striker. Well said Nigel!! Maybe he could call Arsene Wenger and give him his views, and why not get Winterburn to pop along to the training days and help Clichy get back to the way we all know Clichy can play. Walcott says we need to find a killer instinct, well I say to Theo, why don’t you start by finding it yourself!! Clichy says ‘Don’t write us off’ – I say to him, try staying on your post for corners and stop going for a wander!! Little bit of news – Luke Freeman and JET have been added to the Champions League squad. JET being added is not too much of a surprise, but Freeman, now that is interesting. He does like to score, but hanging our hopes on such a young footballer is not the best place to be in really. Like I said, it could turn out to be very very interesting….. The FA Cup-Myth or Magic? 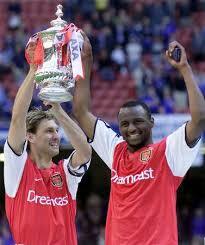 So, onto the the great footballing tradition that is the FA Cup. Over the last few seasons the money now involved in the PL and the CL has, in a lot of teams eyes, made the FA Cup become less important. We have become used to a lot of the top teams fielding slightly weakened sides, not as weakened as what we see in the Carling Cup, but still weakened. Even before Wenger, this competition has brought us many fond memories.Memories that are still talked and laughed about today, either it be down the pub or on a blog. 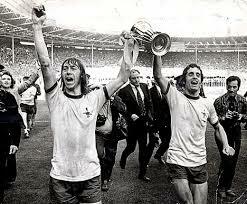 The FA Cup still has that bit of magic about it for me, this competition and The Arsenal go together like jelly and deels. We always seem to win when we play in yellow!! and we are back in yellow for our away kit this year… So please Miss lady Luck..
Everyone moans about us and the fact that we sold the naming rights to our stadium and on our shirts too cheaply.. I think the same can be said of the FA.. if the prize money was increased from like £1 million for the winner to £5 million a lot more clubs and then the fans would take the competition more seriously…. Under Wengers reign we have been a great FA Cup side, reaching many finals and winning the trophy several times, but since 2005 Wengers priority seems to be elsewhere. We no longer seem to be the force we were in this competition and I feel this is a trophy we should be going all out to win, especially this season. 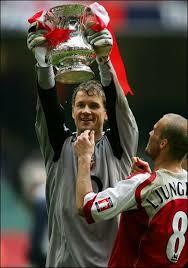 The FA Cup is the most prized domestic cup competition in the world, in any league. Its renowned for its prestige and tradition in world football. Although the money involved is not as great as other competitions this is not a Mickey Mouse cup, this is a cup that earns great respect and lets face it, football is really about winning trophies and earning respect. Although football is becoming more like a business every day, you are not respected in the game for having the biggest wallet, just ask Citeh!!! You are respected for what you have in the trophy cabinet at the end of the season and our cabinet seems to be collecting dust. We have a group of young players, still learning and developing their talent and no matter how much they develop their talent on the training ground or on the playing field, the one thing they can never develop is the winning mentality, to do this they need to win something. Football is like many other sports, its all about confidence, you can have the most talented potential in the world but it doesn’t mean anything if that talent doesn’t believe they are winners. They need the right mentality, the winning mentality, Wenger seems to think these players can go out and win the PL and the CL but i think this is a case of trying to walk before we can crawl. One trophy, just one, and these players will start to believe in themselves. It could be the start of something special. 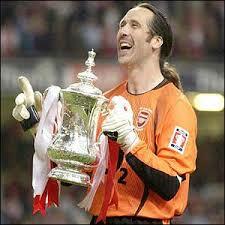 I honestly believe the FA Cup is the easiest trophy to go for. The league is not impossible, but its highly improbable. The CL however is still there for the taking, on our day we can beat anyone and i feel this season we are a better cup side but we cannot put all our eggs into one basket. Above all the fans have been loyal to the cause, even after all the bollox of this season, we still love the Arsenal to the end, so please Arsene, give us a day out at Wembley this season and lets hope its a successful one at that. Just a few pics to warm the cockles. 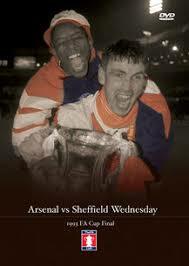 It’s a bit boring being an Arsenal fan today, so I thought I would share some of my first FA cup memories of the Gunners. I was only 7 at the time the date was 8th May 1971.. My parents hated football so as it was a warm spring day, I was lucky they decided to lay a lawn to turf. I had the colour TV all to myself. I can still name that team off by heart no peeping at google. Wilson, Rice, McNab, Storey, McLintock, Simpson, Armstrong, Graham, Radford, Kennedy, George.. sub Kelly. We all know what happened and what the score was.. I can remember jumping around the room like a nutcase and running into the garden shouting (nobody really teaches you that it must be a natural reaction), much to the disapproval of my parents. If you ever read this Charlie… Thanks my friend.. Here are tomorrows teams from two of our posters..
Rico thinks it will be..
Subs – Dudu.. Ramsey.. Lansbury.. Randall.. Vela.. Almunia..Eboue..
Big Raddy thinks it will be. Other news on the Andrei Arshavin saga..
Zenit are giving us until today to up the offer.. Like they are running the deal. This will carry on now until the 2nd of Feb when the bottle goes and they realise that the will get Mr Jack Poo for him in the summer.